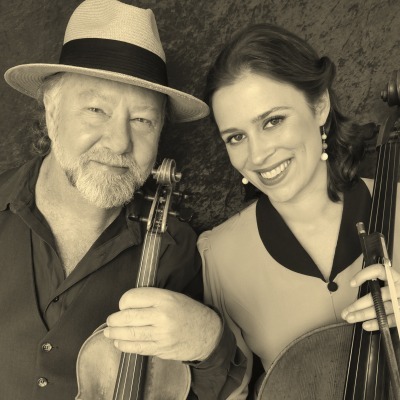 The musical partnership between Alasdair Fraser, long regarded as one of Scotland’s premier fiddle ambassadors, and the sizzlingly-talented young California cellist Natalie Haas may not seem an obvious one. Fraser, acclaimed by the San Francisco Examiner as “the Michael Jordan of Scottish fiddling,” has a concert and recording career spanning over 40 years, with a long list of awards, accolades, television credits, and feature performances on top movie soundtracks (Last of the Mohicans,Titanic, Stone of Destiny). Fraser has been sponsored by the British Council to represent Scotland’s music internationally, and received the Scottish Heritage Center Service Award for outstanding contributions to Scottish culture and traditions. The 31-year-old Haas, a graduate of the Juilliard School of Music, wasn’t even born when Alasdair was winning national fiddle competitions on the other side of the Atlantic. But this seemingly unlikely pairing is the fulfillment of a long-standing musical dream for Fraser, whose cutting-edge musical explorations took him full circle to find a cellist who could help him return the cello to its historical role at the rhythmic heart of Scottish dance music. Natalie Haas was just 11 when she first attended Fraser’s Valley of the Moon Scottish Fiddling School in California. She responded to Fraser’s challenge to find and release the cello’s rhythmic soul, and four years later, when Natalie was just 15, Fraser and Haas played their first gig together. “Haas is the percussive power to Fraser’s fiddle fireworks, providing syncopated, bowed underpinnings to his melodies and solos,” writes Kira Schlechter of The Patriot News. The duo has performs frequently in Europe, and throughout the US and Canada. They have been featured on NPR’s Performance Today, the Thistle & Shamrock, and Mountain Stage, and represented Scotland at the Smithsonian Museum’s Folklife Festival. In addition, Fraser and Haas have busy teaching schedules, including summer fiddle courses in the US, Scotland, and Spain.